The Insolvency and Bankruptcy Code is a masterpiece legislation crafted keeping into account the needs and requirements of the present time. The Insolvency and Bankruptcy code catered to serve the specified persons enshrines within its ambit various processes which are applicable to the target section based on their eligibility norms. On this note, the Insolvency and Bankruptcy Code 2016 imbibes within its horizon Fast Track Corporate Insolvency Resolution Process (FTCIRP). The detailed provisions of the fast-track corporate resolution process are stated in section 55 to 58 under chapter IV of Part II of the code. 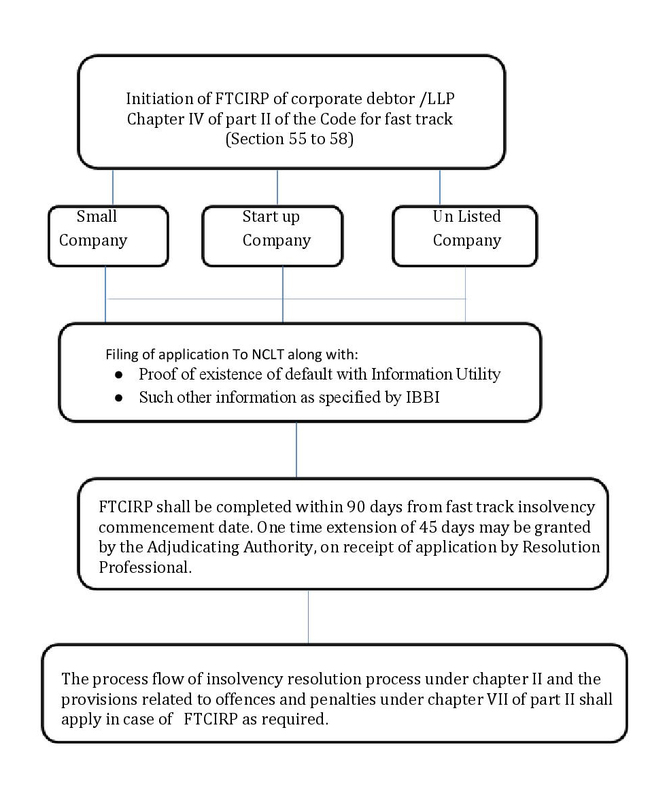 An application for initiating the fast track corporate insolvency resolution process can be made only by a specified category of corporate debtors. As the name highlights, the timeline for the conclusion of fast-track insolvency process is 90 days to be counted from the insolvency commencement date. The time lag can be extended be extended by the concerned Adjudicating Authority only once for a maximum duration of 45 days. Why Fast Track Corporate Resolution Process? As per World Bank estimate, India ranks at 136 out of 189 BRICS nation. Our ranking is comparatively low as compared to Singapore, Australia, UK, and the USA. It has been estimated by World Bank that it takes more than 4 years to wind up a company in India which is twice the time it takes in China where only 1.5 years is required. India recovers only 25.7 cents per dollar in a year. On this rate, a debt is recovered under IBC in 4.3 years in India. Regulations on land and labor prevent selling of property and laying of workmen. In insolvency cases which are presented before Board for Industrial and Financial Restructuring (BIFR), Creditors cannot take action against defaulter until restructuring plan of the sick company is approved and is in place. After having glanced at such alarming facts we get to see that the situation of India in insolvency cases is below standards and required a device of suitable measures to overcome the deficiencies. Also, there was a need for a need for having a shorter process for less complex cases because majority cases related to insolvency were not much complex and for which the existing process for not appropriate. Therefore, keeping into account all of the above the Fast track Corporate Insolvency Resolution Process was drafted. Against whom application can be made? Small company – as defined under the companies act 2013. Startup – as defined in the government of India notification dated 23rd may 2017 as issued by the ministry of commerce & Industry. Unlisted company – whose total assets as reported in the financial statement of immediately preceding financial year, not exceeding one crore Rupees. Such other information as may be specified by the IBBI. As the name suggests the cases falling under this zone are not much complicated and therefore the process can be completed in a short span of time. Keeping into account the above, the code prescribes the duration of 90 days within which The FTCIRP shall be completed. The duration of 90 days shall commence from Fast track insolvency commencement date. The Resolution Professional can file an application to the concerned adjudicating authority for seeking an extension of the duration of FTCIRP beyond 90 days only after obtaining the vote of seventy-five percent of voting share in the meeting of Committee of Creditors. If the adjudicating authority on receipt of the application for extension is satisfied that the FTCIRP cannot be completed within 90 days, the in such a case it may by order extend the duration of FTCIRP by a further duration which shall not exceed 45 days. It is evident to note that the extension of duration beyond 90 days shall be granted by adjudicating authority only once. An Insolvency Professional (IP) shall be entitled to be appointed as resolution professional only if he does not possess any relational with the corporate debtor. The insolvency professional should be an independent person for being appointed as resolution professional. The insolvency professional shall make a disclosure of his independence at the time of his appointment. The insolvency professional on being appointed as an interim resolution professional shall make a public announcement not later than three days from the date of his appointment. The public announcement shall be published in one English and one regional language newspaper which is in widely circulated at the location of the registered office and principal office of the corporate debtor. The same public announcement shall be hosted on the website of a corporate debtor and on the website of the board. The interim resolution professional shall provide 10 day’s time for submission of proof of claim. The operational creditors, financial creditors, workmen, employees, and other creditors shall submit proof of their claims in the prescribed forms along with supplementary documents and clarifications. On receipt of claims, the resolution professional shall verify the claims received within seven days from the end date for receipts of claims. Thereafter a list of creditors shall be drafted by the resolution professional. The resolution professional shall form a committee of creditors consisting of financial creditors and operation creditors of the corporate debtor. Where the corporate debtor does not have any financial debt or the financial creditors are a related party of the corporate debtor then the committee of creditors shall consist of only operational creditors. The resolution professional shall convene the first meeting of the newly constituted committee of creditors within seven days of filing the report.Thereafter the meeting of the committee can be convened at any time as an when required. The resolution professional may convene a meeting of the committee on the request of members of the committee after obtaining a vote of thirty-three percent voting share. The notice for the meeting shall be served at least seven days in advance prior to the date of the meeting. The notice for the meeting shall be in writing and delivered to the members either by hand delivery, speed post, or electronically. The Resolution Professional shall appoint one registered valuer within seven days of his appointment to ascertain the liquidation value of corporate debtor. The registered valuer so appointed shall submit an estimated liquidation value after personally verifying the inventory and fixed assets of corporate debtors. The Resolution Professional shall draft and submit an information memorandum in electronic form to the members of the committee of creditors. The resolution plan shall provide shall provide the measure required for implementing it. The resolution plan shall be drafted keeping into account the required mandatory content. The resolution applicant shall submit the drafted resolution plan to the resolution professional within the prescribed time limit. The resolution professional shall, in turn, submit the shortlisted resolution plans to the committee of creditors for seeking their approval. The committee may approve any resolution plan with or without modification as it finds suitable. The resolution professional shall submit the approved resolution plan to the adjudicating authority with required certifications. The adjudicating authority on receipt of the resolution plan shall pass order accepting or rejecting the submitted resolution plan. The biggest challenge is whether 90 days are sufficient for the conclusion of FTCIRP. In Indian Insolvency and Bankruptcy Code, any creditor can propose a resolution proposal. The IBBI is likely to be flooded with numerous resolution plans in just one insolvency matter only. The Resolution professional would need time to understand the company, its cash flows, essential operational creditors before he can prepare information memorandum which is required for the drafting of a final Resolution plan. The robust conclusion of FTCIRP cases will depend on the quality and quantity of insolvency professionals in the market practicing in his domain. Failure to conclude the FTCIRP process within 90 days would ultimately lead to the commencement of the liquidation process. The Fast Track Corporate Insolvency Resolution Process is a very well-crafted process designed to target a specific section of corporate debtors against whom insolvency proceedings can be initiated by the creditors or corporate debtor himself. The time limit is also prescribed in such manner that less complex cases can be completed within a limited time to provide speedy disposal of matters which will provide adjudicating authorities more time to focus their attention on complex matters. Hope this article was helpful in providing an insight into the Fast Track insolvency Process. Stay connected with MUDS for updates.